Hello all, welcome. Today I am doing an unboxing of the game, World of Smog by Cool Mini or Not and Guillotine Games. 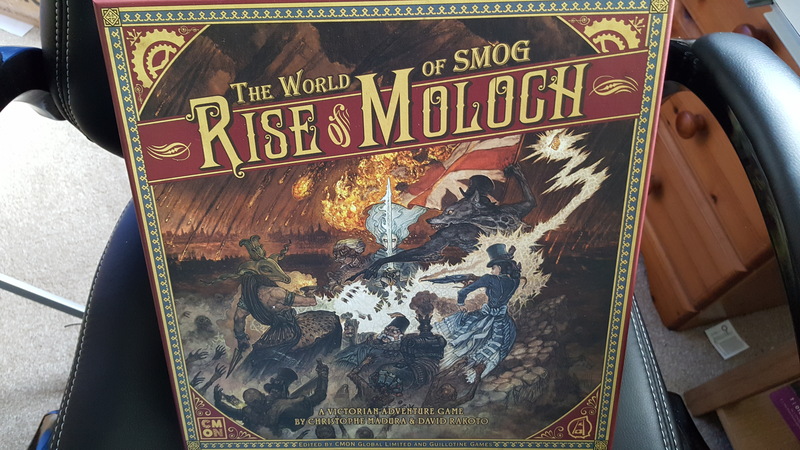 World of Smog: Rise of Moloch (It’s full title) is a Victorian Adventure game set in a Steam Punk London where players take the roles of Gentlemen of the Unicorn Club. The Gentleman of the Unicorn Club being a mixture of bored elite, mad scientists, monsters and magic users. Players take these characters and play against the Nemesis, played by another player. In many respects the game feels similar to Descent, Doom, Imperial Assault or even Heroquest. So, without further adieu, let us look inside the box. and now that we have seen the heroes, onto the villains! and finally, the biggest of them all. And that is the miniatures and cards for World of Smog: Rise of Moloch. I say this frequently, and I shall say it again. It looks awesome, and I look forward to playing it, despite it’s evident similarities to other games I am acquainted – perhaps not a problem since I very much like them. I hope you enjoyed this post. Keep an eye out for in the near future when I start unboxing the expansions. Bye for now!